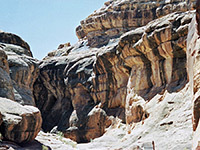 Rock Canyon usually drains into the far northern end of Lake Powell, though in these times of low water levels it now meets the Colorado River directly, some distance upstream of the lake, and has almost a mile of excellent narrow, twisting passageways through whitish Cedar Mesa sandstone, a smaller version of the best parts of nearby White Canyon. Like White it is close to a main highway and is easy to explore with only one obstacle to be overcome, a deep pool and chokestone below the narrowest part, yet the area seems to be very infrequently visited. The highlight of this canyon is towards the upper end, which has a long, sinuous slot that later opens out into a wider middle section and eventually narrows once more, ending with a big drop off just before the Colorado River junction. 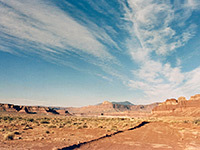 The access route for Rock Canyon is the Hite Road (later the Flint Trail) that leaves UT 95 between mileposts 46 and 47, just north of the Colorado River crossing and almost opposite the Hite Airstrip, then heads east, eventually entering the Maze District of Canyonlands NP. The junction is a little hard to spot but there are no other side roads in this area so no chance of picking the wrong one. The route is along this good quality gravel track, past one rocky place, around a promontory and into a wide slickrock valley bordered by crumbling maroon cliffs. 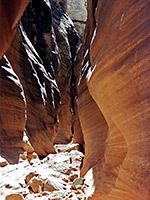 The slot canyon is about 4 miles long and cuts deep into the flat valley floor, while the track follows close to one side, crosses over where the upper end becomes shallow and turns back along the far side. 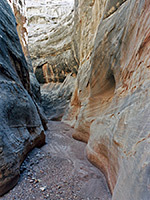 The canyon is often only 100 meters from the track and has many possible entry points; one option, described below, is to park about half way along, walk to the edge and explore the upstream and downstream sections separately. 22 views of Rock Canyon. TopoQuest topographic map of Rock Canyon; the best narrows are northwest of point 4767T. 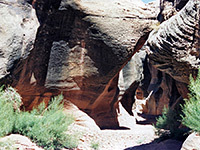 - The middle of the canyon is rather shallow, with a floor that alternates between sand and slickrock, and sloping sides of many layers and ledges made of weathered white sandstone, dotted with occasional bright green bushes and cottonwood trees. After a short walk downstream the slot section starts abruptly beneath a dryfall of several meters, which is not climbable at this point but there is route down a hundred yards or so on the left side. 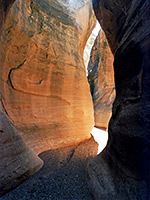 Ahead is a moderately narrow passageway, enhanced by pretty, light colored rocks that overhang in places and have streaky patterns of desert varnish, a bit like Willis Creek. The walls are quite sheer, worn smooth and in one place form a semi subway passage where the opening at ground level is rather wider than above. Not far after the end of this channel, the ravine opens out somewhat and drops more than 300 feet in two stages as it approaches the Colorado River. A round trip to this point takes about 2 hours. - The streamway remains wide for half a mile or so upstream, starting to constrict again a little way past a side canyon that joins from the west. Again the cliffs soon become vertical, sheer and smooth, and the sandy streambed is briefly replaced by an unusual flat rocky plateau pitted by many little potholes. The cliffs close in sharply at the far side and a dark, narrow passage continues, usually with a long pool of cold muddy water up to 5 feet deep. 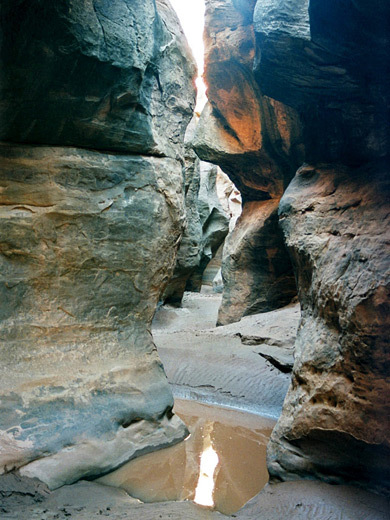 The water ends under a chokestone which is a bit tricky to climb over but the effort is rewarded by half a kilometer of high quality narrows that lie beyond. The passages are nicely lit, orange-white in colour and quite enchanting. 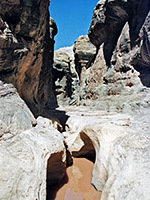 They contain a few other pools, the final one beneath another dryfall of several meters that can't be passed, but there is an exit route to the canyon rim a short distance back on the west side, up a steep gully. This is the end of the best part - above the dryfall is a short section of intermediate width, then a higher dryfall and a much shallower canyon beyond.